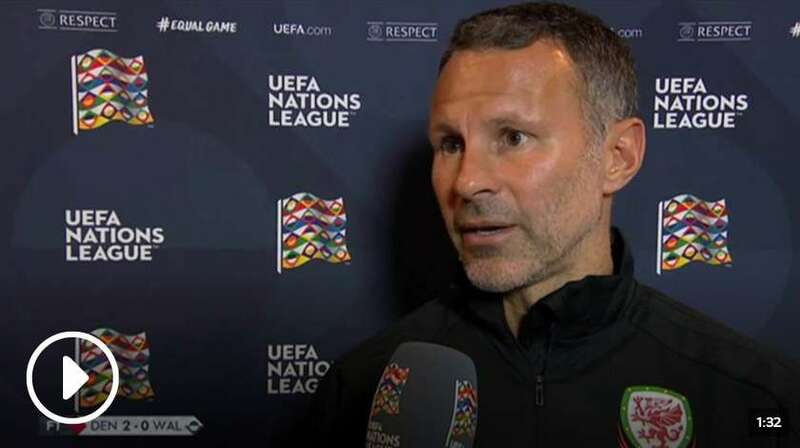 Wales boss Ryan Giggs called the decision to award a penalty for a handball by Ethan Ampadu "harsh" after his side lost 2-0 to Denmark. Christian Eriksen's double proved too much for Wales, who were handed a reality check after their impressive 4-1 win over the Republic of Ireland on Thursday in their Nations League opener. However, Wales were still very much in the game before the crucial second goal, which came after the referee penalised Chelsea youngster Ampadu for stopping a cross with his hand although it looked unintentional. Giggs said: "Was it a penalty? It looked harsh. After that it was an uphill task against a good team." After a turbulent week for Denmark, whose players went on strike in a dispute with their FA, they looked the fitter team having fielded a side full of part-time players from the Danish league in their 3-0 friendly defeat to Slovakia on Wednesday. Giggs felt fatigue played a huge part in the closing stages but remained proud of his team's efforts. "They were a lot fresher. They had no game - our lads had played two games," he added.